Never Smile At A Crocodile. 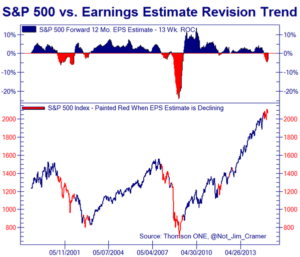 Extreme Valuations Accelerate. Never smile at a crocodile. No, you can’t get friendly with a crocodile. Don’t be taken in by his welcome grin. He’s imagining how well you’d fit within his skin. Never smile at a crocodile. Never tip your hat and stop to talk awhile. Never run, walk away, say good-night, not good-day. Clear the aisle but never smile at Mister Crocodile. The jaws have opened wide in the two charts shown above. Somewhere there is supposed to be a hinge beyond which it is impossible for the jaws to widen any further. However, central banks are conducting experiments never tried before. Last week’s note showed the extreme valuation of the US equity market using current and historical data. The explosive blue line in both charts above is the price of the S&P 500 relative to forward earnings estimates. During the recent S&P 500 rally the US dollar (shown inverted in the first chart) has had a record run. As around half of the S&P 500 earnings are sourced from other currencies, earnings expectations have been falling fast even as the stock market has continued to rally. 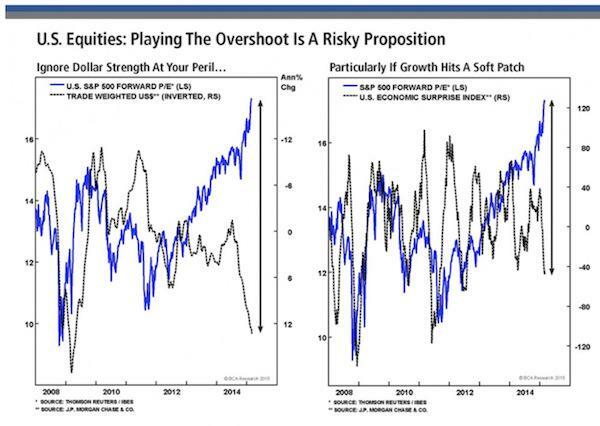 This means that valuations are now accelerating higher from already extreme levels. It turns out that domestic forces are, in general, not helping either. The second chart shows a fall in the US domestic indicator of macro data, the economic surprise index. It seems that the domestic component of economic health is also in decline. This data seems to be corroborated by data compiled by the Atlanta branch of Federal Reserve. This currently calculates that Q1 2015 GDP is tracking just 0.6%! Also, retail sales have just declined for 3 consecutive months, the worst run since 2008. All told the fundamentals appear to working against the rally in the S&P 500, and there has usually been a link between the S&P 500 performance and these fundamental trends. However, very little is normal in today’s central bank driven markets. Since April 2013, when it is now clear that central banks stepped up their market intervention activity, the Wall Street Journal reports that the Bank of Japan (BOJ) has directly bought stocks at least 143 times! Not only is the BOJ the dominant player in the bond market, but it has become the biggest player in stocks too. Markets, as we used to call them, no longer exist as they did before. Quite how much involvement there is in the S&P 500 is much less clear. However, there is little doubt that it has been a major factor and buyback activity has also never been greater, as has been discussed before. If central banks can simply print money at will and then buy stocks on a huge scale, then normal measures have been suspended. Central banks are taking over price setting from valuation metrics, which now simply reflect the risks involved should central banks ever stop. Investors need to be clear how much they are now trading central bank interventions, rather than investing in assets with intrinsic value. Uniquely the S&P 500 has in recent months been holding up even though earnings estimates have been falling. The chart below shows how rare this is. Investors should also understand that this is also an environment of massive misallocation of capital. Printing money and distorting markets cannot resolve the world’s accelerating problems. It is more likely to accelerate the decline in world growth as real capital flows freeze up. Normal price signals can no longer be trusted in the way they once were. This is why it has become essential to understand and react to current dynamics. Static assessments have been significantly downgraded for the time being. How did we get here? The best long term analysis is provided by Nomi Prins, who has studied the deep history of banking for more than a hundred years, and produced incredible information sources in her remarkable book “All the Presidents Bankers”. Here is a great introduction through this fascinating interview.